Fancy a spot of lunch on a cold winter’s day? If you join us at the Geese and Fountain for lunch on any weekday between now and the end of March, all our lunchtime dishes are 20% cheaper. Every dish on the menu, every day from Monday to Friday. For everyone. No small print, no fuss. Just cheaper lunches to help everyone get through the January blues and the winter weather. 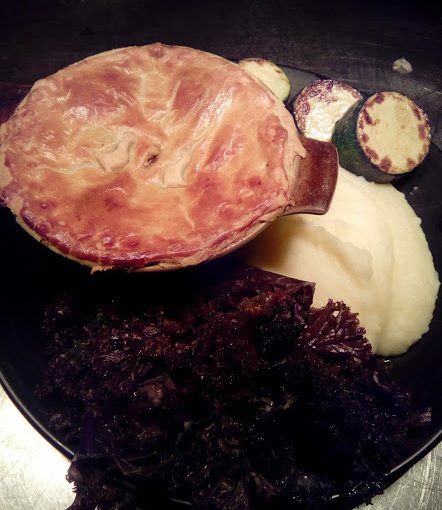 So our delicious pie of the week, served with chips or mash, will be just £9.60, vegetable quiche, fries and salad is only £8, and the day’s soup is now just £4 – still the same great quality, just spectacularly good prices. 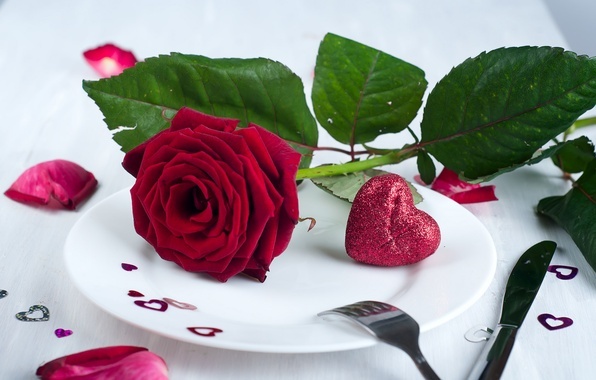 Posted on January 17, 2019 Leave a comment on Winter lunch? Have 20% off on us! Treat your loved one to a romantic candle-lit dinner. A tapas menu designed to tantalise the taste buds, special offers on Prosecco and sparkling wines, and a cocktail menu to round off the evening in style. Our Valentine’s Tapas Menu is available on Thursday, February 14th (Valentine’s Day itself), Friday 15th and Saturday 16th. 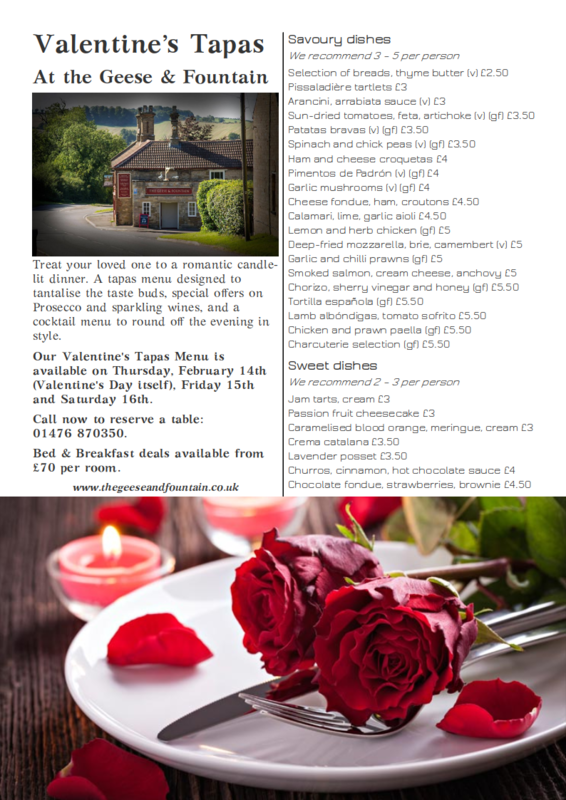 Call now to reserve a table: 01476 870350. Bed & Breakfast deals available from £70 per room. If you’ve never heard of “Tryanuary” it’s an annual campaign to get people to use the start of the new year to try new beers – whether bottle, can, cask or keg. It’s a fun campaign with a serious purpose, to help counteract the negative connotations of so many ‘new year’ efforts to persuade you to abandon beer for the month. At the Geese and Fountain, we love trying new beers. We’ve got an ever-changing choice on the bar, in both cask and keg, and our cellar is groaning under the weight of over 150 different beers in bottles and cans. There’s lots of variety – from peanut butter stouts and coffee porters to juicy IPAs and mouth-puckering sours and saisons. Whatever you’ve tried in the past, we think we can challenge you to try eight new beers this month for TRYANUARY. 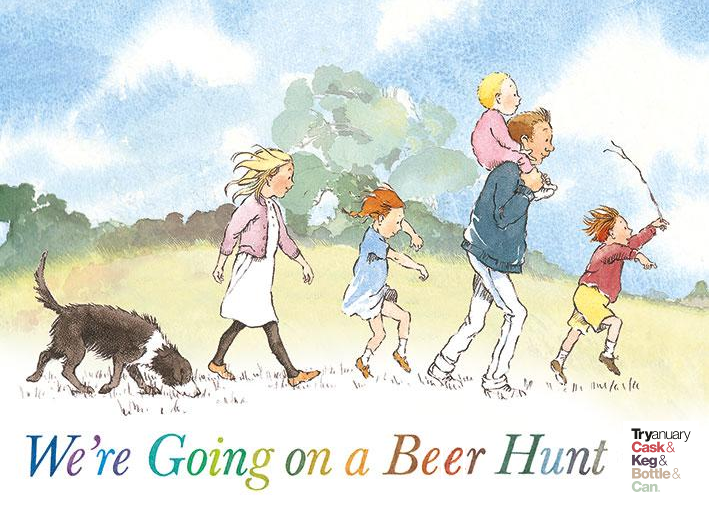 So we’ve devised a beer hunt challenge. 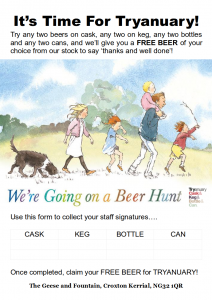 Try any two beers from cask, any two from keg, any two bottles and any two cans from our stock, and then we will reward you with a FREE BEER – in any format you like! Offer applies from now until January 31st, 2019. 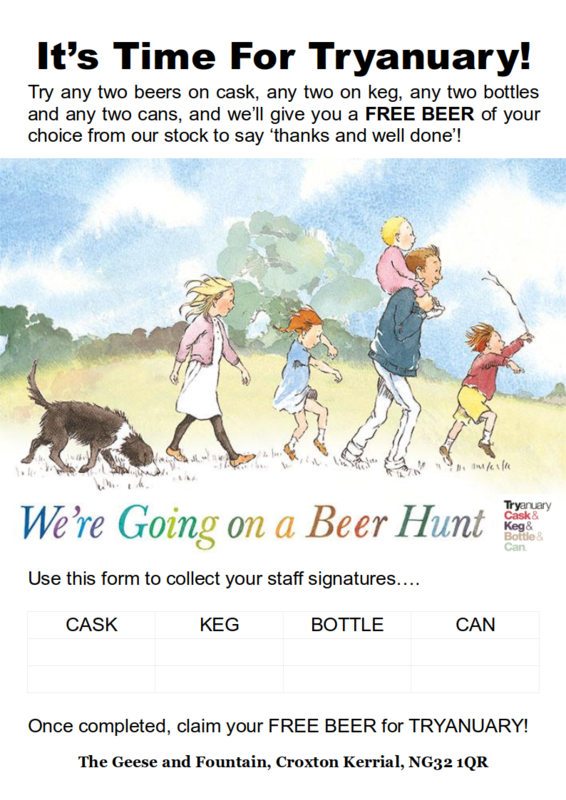 Download the form here, or ask at the bar for a ‘beer hunt’ form and good beer hunting! A month without alcohol isn’t exactly our cup of tea, but if you are doing Dry January, you don’t need to avoid the pub. At the Geese and Fountain, we always pride ourselves on offering a wide choice of drinks for all our customers, and that includes those who are not drinking alcohol, whether for health reasons, because of their age, or just through personal choice such as ‘Dry January’. We take seriously the idea of the pub being a community hub, and that includes the whole community, not just the ones on beer, wines, ciders or spirits! So we have a wide range of soft drinks: from the commonly available Coke and Pepsi (yes, we stock both), to the less common Fentimans (try their Dandelion and Burdock for a taste of days gone by). Locally produced Belvoir Fruit Farms (the famous Elderflower Presse is our biggest seller, but their ginger beer is really good too) and a wide range of tonics (mostly Fever Tree but also Lamb and Watt, and even a Fentimans grapefruit tonic which is really refreshing) are also on the shelves. But we don’t stop with the soft drinks. You may be giving up alcohol, but that doesn’t mean you have to give up the beer! We stock alcohol free beers from BrewDog, Erdinger, Bitburger, and Nirvana (including a surprisingly good alcohol-free stout), and even a non-alcoholic version of our popular Stowford Press cider. And then there are the spirits. If you’re missing your gin and tonic, don’t worry, we have two flavours of the excellent Seedlip Non-alcoholic Distilled Spirit (that’s alcohol-free gin to you and me), which pair beautifully with a tonic, and we also have the new Strykk alcohol-free “Not Rum” and “Not Vodka”, which make a refreshing change from the usual. And if none of those is your cup of tea – we can make you a cup of tea: English Breakfast, Earl Grey, Roiboos, red berry, peppermint or green tea! Like we said, we like to give you a choice. Posted on January 12, 2019 January 12, 2019 Leave a comment on Doing Dry January?We’ve got you covered! Join us at the Geese and Fountain between Christmas and New Year (“twixmas”) for a special dinner, bed and breakfast deal to give you the perfect way to end the year and prepare yourself for the excitement of New Year. A drink on arrival – medium glass of wine or pint of any of our draft beers. 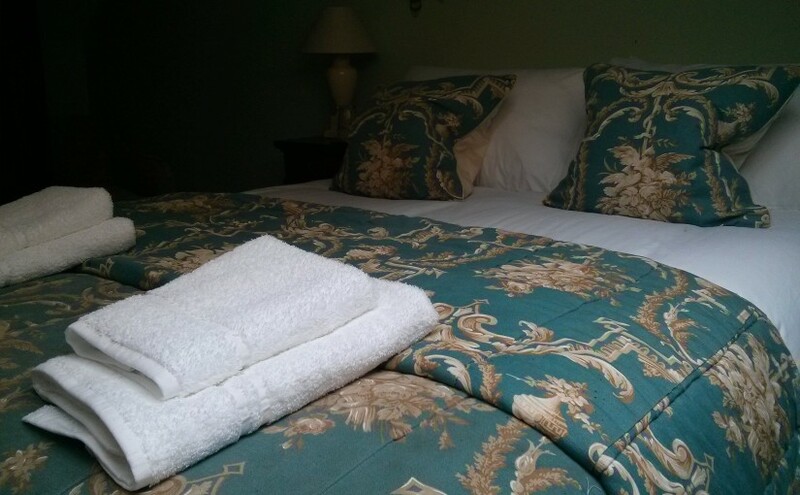 One night’s B&B accommodation in a double or twin room, or a king size double if available. Full choice from our outstanding breakfast menu, served between 8.30am and 10.30am. Three course dinner – order from our pub classics, daily specials and pizza menus. Complimentary late check-out, up until midday. The total price is £49.50 per person when two are sharing. A solo supplement of £12.50 applies. Available for one night’s stay on December 27th, 28th or 29th, 2018 only. Call us to book on 01476 870350, quoting the “twixmas offer”. Posted on December 5, 2018 Leave a comment on Stay with us for Twixmas! It may still be September, but Christmas Party planning season is upon us. 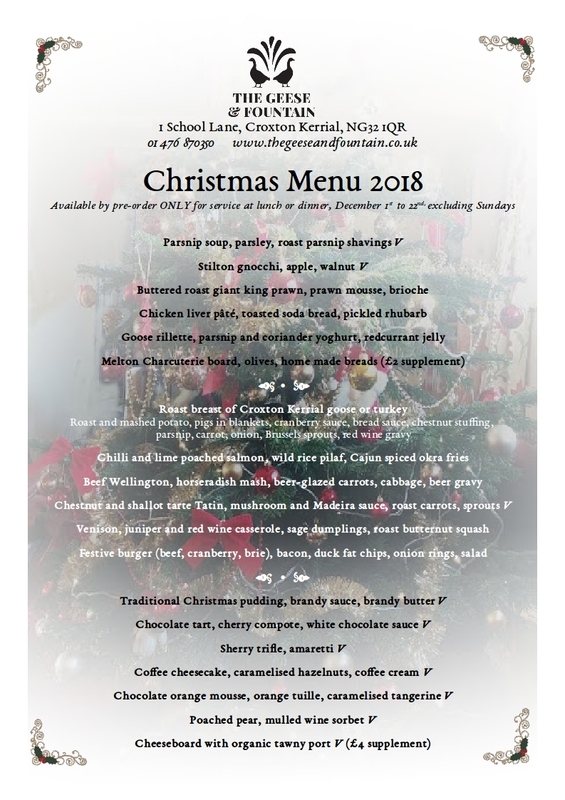 Christmas at the Geese and Fountain is always a special affair, with a fabulous seasonal menu, and our very own Croxton Kerrial geese and turkeys taking centre stage. The Botterill family have been rearing birds for Christmas for decades now, and the quality really shows. If it’s a traditional Christmas dinner you want, there’s simply nothing to rival goose or turkey with all the trimmings. But there’s plenty of choice if you want something a little different. This year, we have a Cajun-inspired option, with chilli and lime poached salmon, served on a bed of wild rice pilaf with okra fries. Our beef Wellington is rightly famous, and comes with horseradish mash and beer-glazed carrots. Venison casserole and sage dumplings is the perfect comfort food option, while the vegetarian dish of chestnut and shallot tarte Tatin is both stunning and delicious, served with a rich mushroom and Madeira sauce. This year, we are also offering our Festive Burger, so popular last year on the ‘a la carte’ menu, as part of our Christmas Party menu, so if you’re hankering for classic pub food this Christmas, we’ve got you covered for that too. Starters include the truly spectacular giant king prawns, farmed in Indonesia by The Happy Prawn Co, a world leader for ethical and environmental prawn fishing, our own chicken liver pâté with pickled rhubarb, stilton gnocchi with diced apple and walnut, and a charcuterie selection from the wonderful new Melton Charcuterie company – it’s no wonder Melton Mowbray is known as the “rural capital of food” with so many fabulous food businesses now operating in the borough. 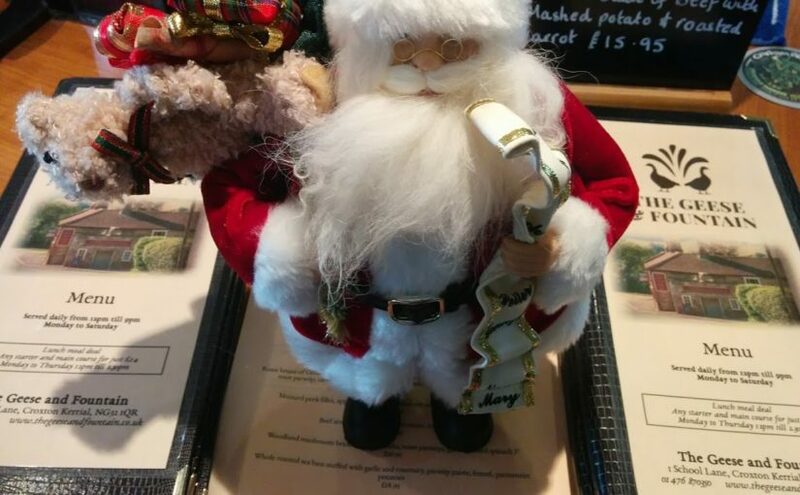 As for desserts, there is, of course, traditional Christmas pudding, sherry trifle or a cheeseboard served with our outstanding organic tawny port. But there’s also poached pears served with mulled wine sorbet, chocolate tart with cherry compote, or chocolate orange mousse with caramelised tangerines and orange tuille biscuits. 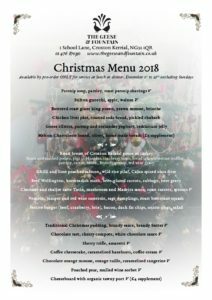 There’s truly something for everyone on this Christmas menu, whether you’re a traditionalists or in search of something new and adventurous. Our Christmas menu is available throughout December, from the 1st to the 22nd, excluding Sundays, and is only available by pre-order. You can have the Christmas menu on your own if you wish, but we obviously can also cater for groups up to 30 people. Some dates in December are already filling up, so please get in touch with us to discuss your requirements, especially if you are calling on behalf of a larger group. Please download the menu here. It’s awards season, and we’ve already announced our inclusion in the final short list of the Grantham Journal Business Awards “Great Taste” category. But today we have another fantastic announcement to make. In the Leicestershire Promotions 2018 Tourism & Hospitality Awards, the Geese and Fountain has been shortlisted not once, not twice but three times! We are a finalist in the ‘Best Casual Dining Experience’ category, the ‘Best Pub Experience’ category, and (possibly most exciting of all) the ‘Best Leicestershire Breakfast’ category. We’re unbelievably proud of making the final in all three categories. It’s such a boost for us, and recognition of all the hard work our staff have put in over the past three years. The winners will be announced at an awards ceremony on November 29th, and we are really very excited about the event. 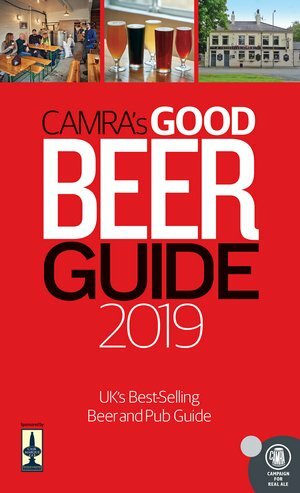 We’re in the Good Beer Guide. Again. 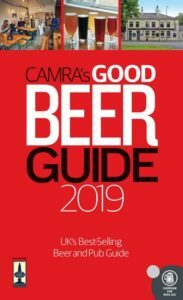 We’re very pleased to be able to announce that the Geese and Fountain features in the 2019 Good Beer Guide, produced by the Campaign for Real Ale (CAMRA) to be the definitive directory of the nation’s best real ale pubs. Thanks go to all CAMRA members, especially those in the Vale of Belvoir branch area, who submit beer scores to CAMRA’s online national beer score website, which forms the basis for shortlisting and selecting the pubs deemed worthy of inclusion. We also want to thank those CAMRA members who go the ‘extra mile’ by volunteering to take on key roles within the local branches, or at regional or national level. We know what it’s like to pour hours of your life into something, and we hope you know your efforts are appreciated. We look forward to welcoming lots more CAMRA members to the Geese & Fountain in 2019. Posted on September 13, 2018 Leave a comment on We’re in the Good Beer Guide. Again. The Geese and Fountain has been named as a finalist in the 2018 Grantham Journal Business Awards. In the category of ‘Great Taste’, open to all business serving food or drink, whether hotels, restaurants, cafes, pubs, or takeaways, we are one of only three in the region to be selected for the awards shortlist. The competition was looking for businesses that demonstrate outstanding creativity, customer service and top quality food. We’re absolutely delighted to be short-listed for such a prestigious award. 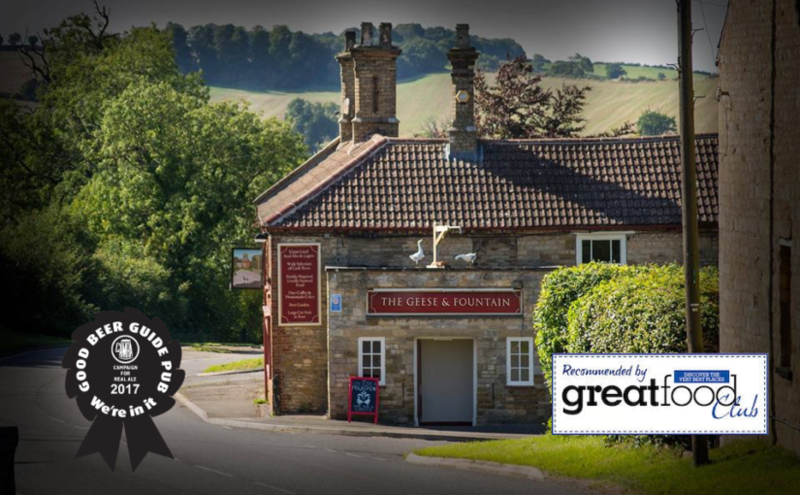 According to the Grantham Journal this week, the three finalists in the category are Dougie’s Cakehole in Barrowby, the Leadenham Teahouse and the Geese and Fountain. Over 200 nominations were received by the paper for this year’s business awards. The final winners will be announced at a gala dinner on November 2nd, held in the amazing St Wulfram’s Church, Grantham. “It’s delivery day,” squeaked Piglet. And today has been a very good delivery day indeed. Thanks to our friends at Jolly Good Beer, at James Clay and at Beer Metropolis, we are delighted to have added a big stack of new beers, including lots of exciting stouts and porters. They’ll be added to the Drinks List over the next couple of days, but they’re available to drink now. 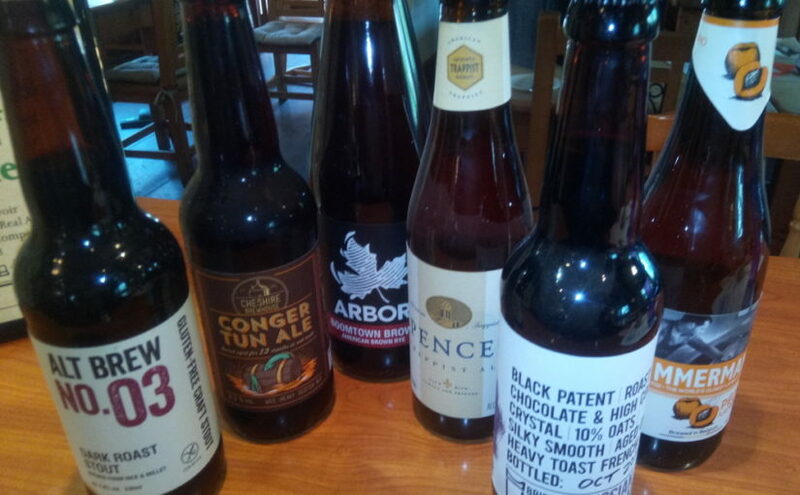 If you want to reserve some, please get in touch with the pub and we’ll put some aside for you. Please note: the prices shown are ‘drink in’ – like always, take-away is at 20% discount. Loyalty card discounts also apply.